I’m not here to tell you what can or can’t be on your calendar or how many activities you should or shouldn’t do in a week. That’s for you to decide what best fits your family. I’m here to ask you a few helpful questions to get you there. For me, the more things that show up on my calendar my breath constricts and life spins like a whirlwind around me and I can’t quite catch my balance to stand up. I hate that feeling. I hate feeling like I have no control, no choice in what is happening in my family life. But I do have control. We make choices everyday of what we will allow into our lives. Granted there are certain things we can’t control, but our response and what we say “Yes” to—we can. What do I mean? When I’m not watching our calendar, when I’m not pacing our in’s and out’s, our family life can become hectic pretty fast. Rather than enjoying the things we’re doing or the people we’re seeing, they become built up stressors ready to explode, because I haven’t taken the time to examine what is really best for us or planned for tight spaces. Today we’re going to streamline our calendar for December, filling our days with people and events that meet our family’s vision and Christmas, while bringing us the most joy and least stress. 1. Don’t be a slave to the calendar. Print out a blank December calendar and pull out a piece of paper (or print the Streamline Your Christmas Calendar printables at the bottom of this post). Make a list of all the events you could attend, have attended in the past, you or immediate family want to attend, and events you feel obligated to attend whether you want to or not. Think of church functions, community events, school functions (concerts, plays, parties), service activities, and family gatherings you could attend. What is physically, emotionally, and financially feasible? Do you still have room to breath? Next to each event write the date and note anything you need to bring to the event (food dish, gift, white elephant gift, ugly sweater, etc). Mark the events with their priority level: Must Do, Like to Do, Obligated, No Preference, Nope!. Starting with the highest priority place the events on your calendar. How fast did it fill up? Does looking at it cause anxiety? Is it something you’re looking forward to? If you’re feeling that tension, pare down. Leave only what is a high family priority and you all will enjoy. 2. Keep family sanity a priority. How will the events on your calendar affect your family’s needs? Bedtimes? Sensory issues? Need for interaction or stimulation? Too much stimulation? Diet? Financial concerns? How do these events encourage or detract from your tangible and intangible priorities? 3. It’s not set in stone. Once the month is underway and if you find what is left on your calendar is too much, then cut back. If it turns out you’d really rather not go to another ornament exchange or bring 2 dozen cookies to a cookie decorating party, then don’t! On the flip side, if you find something you’d really like to do, then do it! Your calendar is not set in stone and you are it’s master. Don’t be afraid of disappointing others. Remember your aim is less stress and more joy for you and your family. If it’s causing you stress and detracting joy, then let it go. So often we get to December and wrapped in the season, before we know it we’re overcommitted and stressed out by all the good and fun things to do or attend. They’re not bad, but they may not be best for you and your family, at least right now. Next year will be a new Christmas, another season for your family to evaluate the previous year and work toward what fits your family this year. After you’ve filled in your calendar and planned all the parties, I hope you have found room to breathe. To laugh and dance and play. I hope you’ll find a few days where spontaneity takes you by surprise, room in your days and heart for little joys. 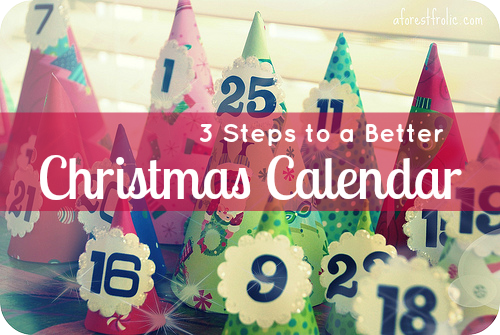 Don’t spend the Christmas season feeling trapped in a tightly packed schedule or even a light schedule. Leave room for joy. And be brave to do what’s best for your family. 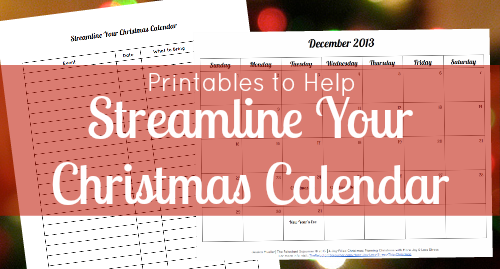 Today start jotting down all the events you’d like to participate in this Christmas season and use the Streamline Your Christmas Calendar printables (Calendar & Activity List) to organize it all! Great post! Just the thing I needed to read as we head into the holiday season!